Penny's Coffee offers two distinct environments for your private event. Nestled on the first floor of the Minoru Yamasaki-designed 100 Washington Square, Penny's Downtown offers a gorgeous open atmosphere, adorned with green marble walls and 40 foot floor-to-ceiling windows. 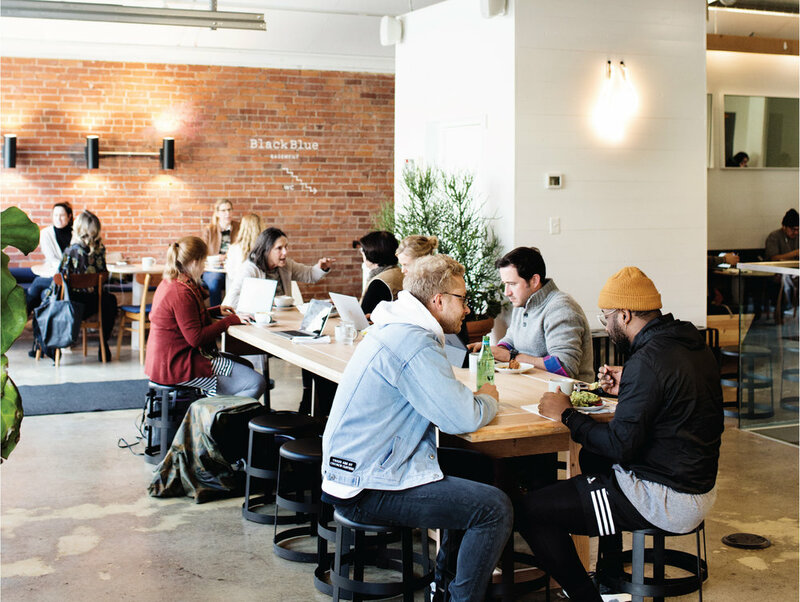 Our Linden Hills cafe, located on West 44th Street in Southwest Minneapolis, provides a charming, industrial space with easy access to some of the city's most celebrated lakes. Ideal for anniversaries, corporate events, birthday celebrations and more, Penny's consistently provides a thoughtful and elevated experience. Gather your guests and come hang out with us. When choosing to include coffee and tea at your event, two baristas will tend the bar. In addition to our own menu, we can also provide exceptional catering services for any occasion. Please visit PennysCoffee.com/catering to learn more. Penny's Downtown can accommodate 50 guests, while our Linden Hills location is suitable for up to 100. We can accommodate any schedule for your event. We typically receive requests to reserve the space from 6pm onward, but we can certainly make arrangements for any time of day. Upon receiving the included form, we will reserve your event and send you an invoice upon delivery. We kindly request payment within 30 days of receiving your event's invoice. Your event may be canceled up to 48 hours prior to the scheduled date to receive a complete refund. Most cancellations made after this period are eligible for a 50% return. Please contact us with any questions specific to your event, and we will be more than happy to discuss terms in greater detail. You are 100% responsible for your event. Penny's Coffee is not responsible for any injuries during your event. You are also responsible for replacing anything that may be broken or damaged during your event. someone from our events team will reach out to finalize any necessary details including pricing and reserve your date at your preferred location. We appreciate you considering Penny’s and look forward to hearing from you.